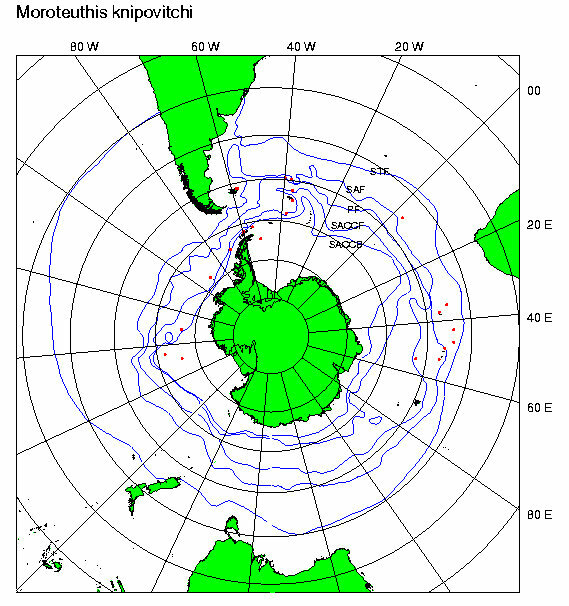 F. knipovitchi reaches a size of at least 450 mm ML (Kubodera et al., 1998) and is found in circumpolar Antarctic waters. Club with 10-15 (Kubodera et al., 1998) or 13 (Filippova, 1972) pairs of hooks. Long, slender hooks of ventral series have asymmetrical bases (see drawing below). Figure. Oral view of tentacular club and large club hook of F. knipovitchi. Drawings from Filippova, 1972. Figure. Oral view of tentacular club of F. knipovitchi, 295 mm ML, female. Photograph by R. Young. Scanning electron micrographs of the club hooks can be found here. Skin smooth (i.e., no welts or ridges) (photograph of anterolateral mantle skin at right). Figure. Portion of skin on anterodorsal mantle of F. knipovitchi, 295 mm ML, female. Photograph by R. Young. Rhomboidal shape, not drawn out into a tail. Figure. Ventral view of fin of F. knipovitchi with indication of rostrum length, 295 mm ML, female. Photograph by R. Young. Rostrum short, 1/12th of GL (measured from ventral edge of conus); triangular in cross-section (dorsal surface flat, ventral surface pointed). Figure. Ventral view of gladius F. knipovitchi with cross-sections. Drawings from Filippova, 1972. Except where noted, this description is taken from Filippova (1972). The slender, asymmetrical hooks, smooth skin, homodont radula (see next page) and the rhomboidal fins characterize this species. F. knipovitchi was originally attributed to the genus Moroteuthis (= Onykia) due to its lack of photophores and secondary occipital folds, the proportions of the gladius, and the rounded funnel groove. However, it also possesses other character states more closely allied with the genera Onychoteuthis, Ancistroteuthis and Notonykia (smooth mantle epidermis, large fins, asymmetrical ventral tentacular hook bases, unicuspid rachidian tooth). These morphological characters, combined with two recent molecular studies (Bonnaud et al., 1998; Wakabayashi et al., 2007) placing F. knipovitchi outside the genus Onykia, caused Bolstad (2010) to separate 'M.' knipovitchi from the true Onykia species, and place it into the new genus Filippovia. The type locality is near South Georgia Island. This species is found only in Antarctic waters. A map of its distribution can be found here. Bonnaud, L., P. G. Rodhouse and R. Boucher-Rodoni. 1998. A phylogenetic study of the squid family Onychoteuthidae (Cephalopoda: Oegopsida). Proc. R. Soc. Lond. B 265:1761-1770. Filippova, J. A. 1972. New data on the squids (Cephalopoda: Oegopsida) from the Scotia Sea (Antarctic). Malacologia, 11: 391-406. Page: Tree of Life Filippovia Bolstad, 2010. Filippovia knipovitchi (Filippova, 1972). Authored by K.S.R. Bolstad, Michael Vecchione, and Richard E. Young. The TEXT of this page is licensed under the Creative Commons Attribution License - Version 3.0. Note that images and other media featured on this page are each governed by their own license, and they may or may not be available for reuse. Click on an image or a media link to access the media data window, which provides the relevant licensing information. For the general terms and conditions of ToL material reuse and redistribution, please see the Tree of Life Copyright Policies.